Baby Boomers. Gen X. Millennials. And now, iGen. 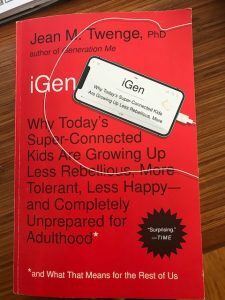 According to psychology professor Jean Twenge, the members of iGen include the children and young adults born between 1995 and 2012. And what sets these kids apart from previous generations, she says, is their near-constant connection to the Internet. Theirs is a generation shaped by the smartphone and concomitant rise of social media…members of this generation are growing up with smartphones, have an Instagram account before they start high school, and do not remember a time before the internet. That list is enough to give any parent or teacher palpitations! But is it a fair depiction of today’s youth? Are “kids today” really that different from their parents and grandparents — and that unprepared for adult life? And if so, are smartphones really the culprit? And if so, what do we do about it? If you’re parenting or teaching iGen, you’re gonna want to listen to this episode!